Make a Gourd Candle Holder! Select candle in glass holder (for safe burning) that fits your gourd. This one is an inexpensive religious candle. 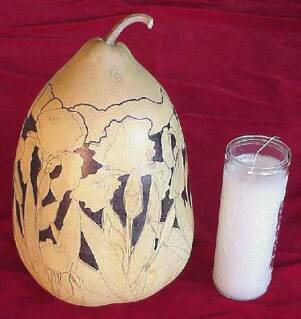 Votive holders can be used in smaller gourds. 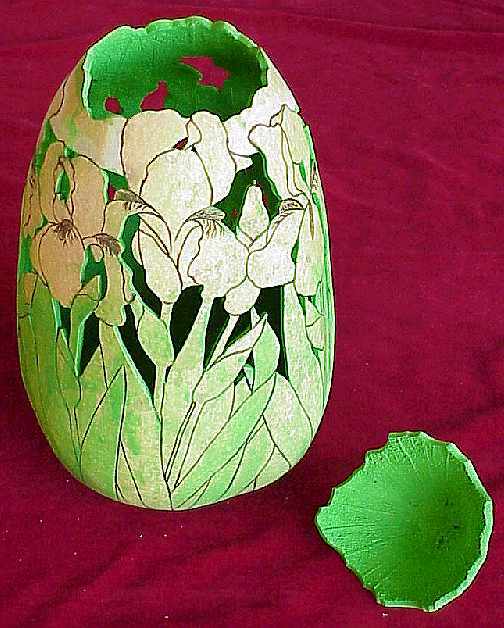 Iris design is drawn on gourd. (A cloud formation has been drawn behind the iris to make a smoother and stronger opening for the lid.) Make sure your lid opening will allow the candle to burn without any gourd over top of the flame!! Areas to be cut out have been outlined in black for better visibility. Cut lid from gourd and clean in the normal manner. If the gourd is thin, you might want to soak the interior with wood hardener to strengthen it before cutting the shell. Follow the instructions and photos below and create your own candleholder! Use your imagination - you can use almost any design! Cut outs have been done using a mini jig saw. 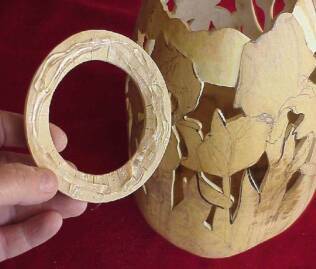 Rough edges of cutouts have been smoothed with a small half round file. 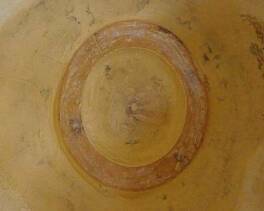 The cloud area has been depressed, raising the iris in slight relief, by grinding with a dremel sanding drum. Finish with hand sanding as needed. For extra stability, the bottom of the gourd was flattened slightly on a belt sander so it would sit firmly. 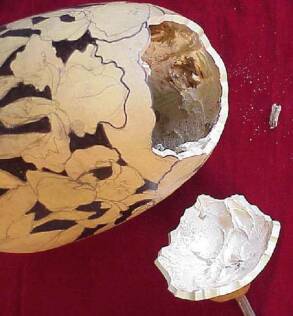 The interior bottom of the gourd was also sanded flat to provide a smooth surface for the candle to rest on. A ring of scrap gourd was cut to fit the candle, and then glued into the inside. (Wood glue, liquid nails or many other glues will work) Filler or putty can be used to fill in any gaps and further flatten the bottom where the candle will sit. The iris design has been pyroengraved. 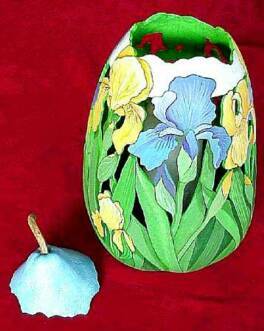 The interior of the gourd has been painted. 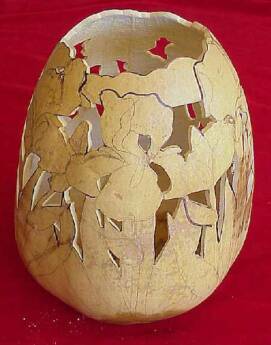 You can use spray paints or thinned acrylic paints to paint the inside and all cut edges. 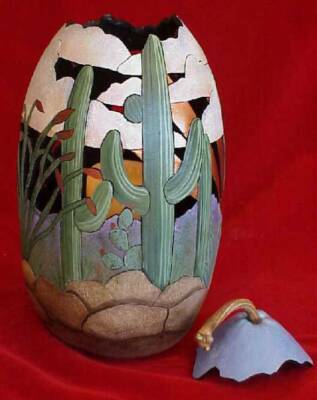 The last step is to paint your gourd. I did this one with acrylic paints. Use care to avoid clogging the pyroengraved lines. Spray with a finish, I usually use Krylon Satin finish on mine. Be sure to leave the lid OFF when the candle is lit! Here is another version of the candleholder! 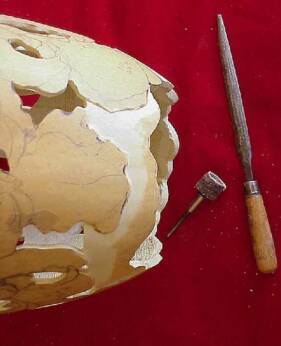 Looking for a mini jigsaw for use on gourds? Check the "Mini Tools" page on this site!